Three different types of Kale, all of them delicious and nutritious! I wrote the following recipe for my friend Jonathan. He is thirteen and has taken an interest in eating well and trying out new foods. He had never eaten kale before but when I told him he could season it to taste like some of his other favorite Italian foods he was willing to try it! 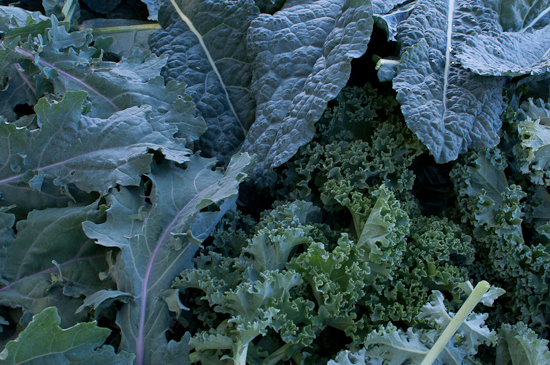 Kale can be grown all year-long in the Berkshires and it can be prepared so many ways. I have a great Kale Chips recipe on my blog and there are literally hundreds of recipes on the web. 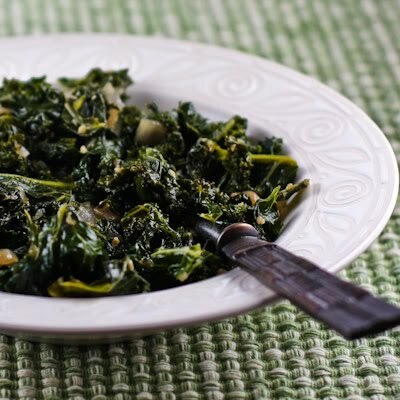 This hearty green makes an excellent addition to any diet. Makes 2 generous portions in about 20 minutes. Ingredients: all organic, all the time! 1 bunch kale, any kind will do! Ribs removed and ripped into pieces. 2 cloves garlic, minced or even better, use a garlic press and press directly into the pan when it’s time to add the garlic. In a cast iron skillet heat the oil over medium heat and add the pepper flakes and fennel. Cook for about 1-2 minutes. Add the onion, capers and sun-dried tomatoes. Cook until the onion is clear and wilted. Add the garlic, stir to incorporate and then add the kale and the oregano. Mix well so that the kale cooks evenly. When the kale is wilted but still has a bit of bright green to it, add a splash or two of balsamic. Taste, adjust for flavor. Add more capers or herbs, more hot pepper and garlic or nothing at all! When I want to turn this side dish into a meal I will separately cook up some hot Italian pork sausage from Holiday Farm in Dalton, slice it and add it to the kale just before serving. French lentils also work really well with this kale dish for a hearty vegan option or in addition to the sausage. Cooked kale, ready to eat! Lacinato kale all the way! We just got some at the Co-op, yum. This looks great. Although I will leave out the capers. Not a fan of them. This might be good for a snack to increase the dark leafy vegetables I eat daily.